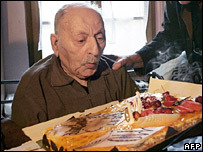 One of the last two surviving French veterans of World War I has died at the age of 110. Louis de Cazenave, who fought in the Battle of the Somme in 1916, died in his sleep at his home in Brioude, central France, his son Louis said. 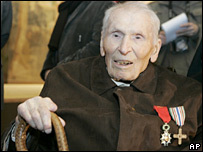 Mr de Cazenave's death leaves Lazare Ponticelli, also 110, as the last "poilu", or French WWI veteran. Mr de Cazenave's son said he died as he would have wanted - peacefully in his sleep at home, surrounded by family. President Nicolas Sarkozy sent condolences to Mr de Cazenave's family and paid tribute to all those killed in the war. "De Cazenave departed with the discretion and simplicity that he had cultivated as a remedy against the fracas and horror of combat." The second-last of the poilus (English: hairy ones) - the affectionate name given since Napoleonic times to French footsoldiers - joined up in 1916 at the age of 19, midway through the war. He was one of the 8.5 million young Frenchmen mobilised to fight the German occupation. In April 1917, assigned to the Fifth Senegalese Rifles, he fought in one of the most disastrous French actions of the war, at the Chemin des Dames, during the Second Battle of the Aisne. The chemin was an 18th Century road straddling a ridge. The Germans took it in late 1914, and after two years of attritional warfare, the French commander-in-chief, Gen Robert Nivelle, recommended a massive assault against them. But squabbling between Allied leaders lead to delays and leaks. Forewarned, the Germans dug in so well that the creeping artillery barrage ahead of the French advance did little to dislodge them. Across the battlefront the French lost 40,000 men on the first day. Some reports say the advancing French bleated in mocking acknowledgement that they were lambs to the slaughter. Mr de Cazenave's family say the experience, which led to French mutinies, left him a pacifist. During World War II he was briefly jailed by the pro-Nazi puppet regime under Marshal Petain, the general who relieved Nivelle after the debacle. "War is something absurd, useless, that nothing can justify. Nothing," he told Le Monde newspaper in a 2005 interview. In that interview, he described walking through fields of wounded soldiers calling for their mothers, begging to be finished off. 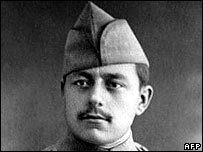 President Sarkozy said Mr de Cazenave's death was an occasion to reflect on the 1.4 million French soldiers who lost their lives, and the 4.5 million who were wounded, during World War I. "This generation has only one remaining representative today," he added in his statement. The last poilu, Lazare Ponticelli, has been told of Mr de Cazenave's death. He is now one of a handful of known World War I veterans left in any of the warring nations.